Because it is sometimes hard to differentiate, many are unclear whether the Jamaican Chocolate Habanero, or Jamaican Hot Chocolate, are actually habaneros, Scotch Bonnets, or their own variety. But either way, they are a very close relative to the habanero, a member of Capsicum chinense, and deserve to be mentioned here. 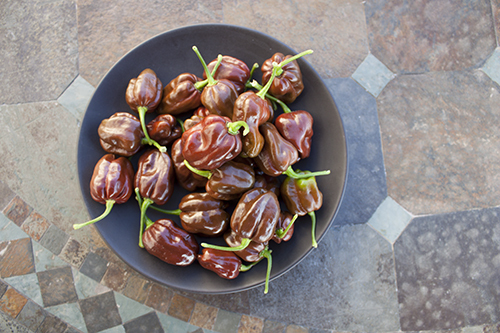 The Jamaican Chocolate Habanero originated in Port Antonio, Jamaica. Maturing from green to chocolate brown, they grow to about 2” long and have intense heat. They have a Caribbean, smoky flavor, which makes them delicious in salsas or the popular Jamaican Jerk sauce or marinade.